We are sure that chicory is a well-known plant for you all. We often see it in the meadows during the summer and autumn. We notice it mainly because of its interesting light blue flowers. Many do not even think that she is a treasure for our health. Do you know that it can be used to make a great coffee? The ancient Greeks, the Romans and the Egyptians knew its curative effects and they cultivated it for it. In addition to greatly influencing immunity, it cleans the body of poison, it is excellent for our digestive organs. Stay with us and find out how chicory as a medicine can be useful to you. Learn how to make a healthy coffee, let's give you some recipes for salads and more. What is chicory and what does this plant look like? National names for her are horse grass, sun flowers, signposts, and many more and in Latin it is called Cichorium intybus. What is chicory? It is a herbaceous and perennial, wild, self-made plant that grows like weed. It is everywhere, along the edges of the forest, along the roads, in meadows, pastures and the like. In a moderate climate zone, its benefits for human health are known and used for centuries. It originates from Europe, but now it is already in Australia and America. This plant grows up to 1.5m in height. In all parts it contains white milk juice, bitter taste. Its root is spindle, extensively spreading and deep into the ground, and the lateral parts reach a half-meter in length. It is white inside, and outer shell is yellowish. In the spring it gets ground level leaves that resemble dandelion. An upright, long, firm tree emerges from the middle, which branches out. On it are rarely alternately arranged long, deep-sized cut leaves that are significantly smaller compared to terrestrial ones. The leaves and the tree are covered with small hairs. The flowers are brightly colored and come out of the armpit of the leaves individually or are at the top of the branch. It can happen that a white or pink flower appear. The chicory seed is small, round, light brown. Depending in which climatic area it is located, there are deviations in the appearance of the leaves. What is the chemical composition of chicory? Chicory abounds with various nutrients, there are vitamins A, B6, B11 (folic acid), C, E, P, K. There is also provitamin A in traces. The present minerals are sodium, magnesium, zinc, calcium, manganese, potassium, iron, copper and phosphorus. It is characterized by bitter substances, lactoin in leaves and tree, and intibin in the root. It then contains pectin, choline, polyphenols, fatty oils and organic acids (tannin, chicory vinegar). One of the most important substances that chicory contains is inulin. This compound is polyphructoside and is only partially digested and most of it comes to the colon, not digested. Therefore, it is considered to be adequate food for diabetics. Inulin is contained up to 20 percent in the root, and when it is dried up to 50 percent. Chicory blooms from July to late autumn, and flowers and leaves are harvested while the plant is in bloom. The root is the richest with medicinal substances, especially in autumn after flowering. It can also be cultivated in the early spring (from the second half of March until the end of May). The grind root is also used as a hot beverage substitute for coffee. First clean it, then cut it longitudinally on the strips and then it is grated so it can be prepared for drying. Drying is done in a place where the shade is, but there is a strong flow of air. When it is completely dried, it is milled and then it resembles a cup of coffee very much. Chicory as a medicine is applied to various disorders. Due to the content of the already mentioned chemical substance, inulin has a positive effect on the prevention of heart disease. It reduces the level of bad cholesterol in the blood, which leads to blood pressure increase. It just increases the likelihood of a stroke and a heart attack. Both water and blood pressure get lower. Then, freshly squeezed juice from chicory leaves stabilizes the blood sugar level. It contains protein adiponectin, which has the importance in diabetes prevention. It has a positive effect on the blood count in case you suffer from anemia. It is important for the prevention of stone formation in the kidneys. It is good in the treatment of jaundice and in pancreatic problems. It prevents the development of infection caused by bacteria due to its antimicrobial effect. In addition, it has both antifungal and anti-inflammatory properties. Chicory medicinal properties specifically express their influence on the cleansing of the organism. It accelerates the body to get rid of the poison, and this especially affects the liver and kidneys. It enhances the secretion of the bile and the removal of water from the body. This facilitates the process of eliminating poison over urine and hose. Cleans the spleen, as well as the blood. 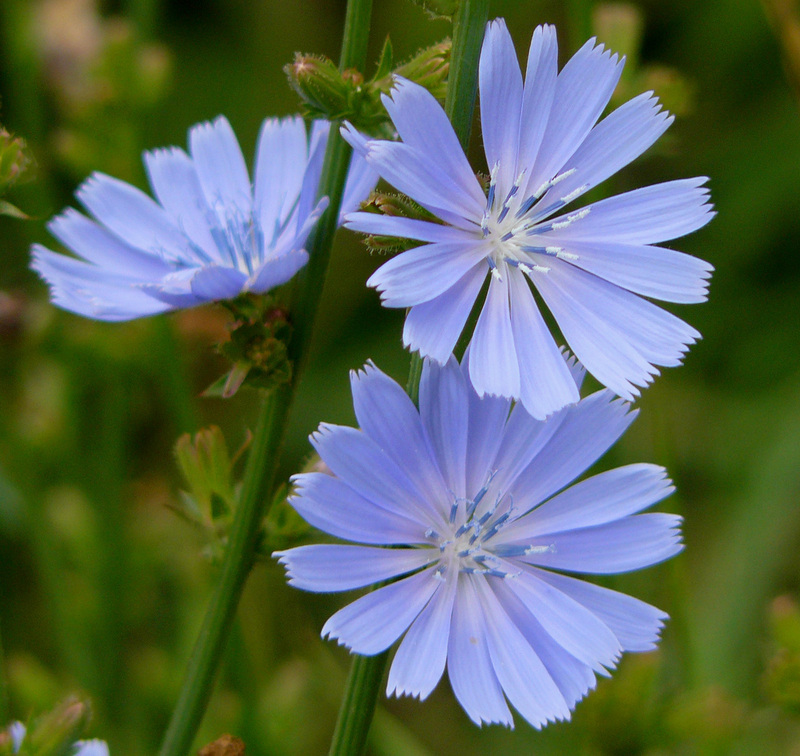 For centuries, chicory was used as a cure for arthritis, and it relieves pain in rheumatism and osteoarthritis. Thanks to its anti-inflammatory properties, it acts on muscle pain and against inflammatory processes. It relaxes pain both in the joints and muscles. It has a calming effect on our body, thus effectively reducing stress and tension. That's why it gives a positive effect in case of insomnia. Therefore, it also has a preventive effect on premature aging, hormonal imbalance and heart disease. Like many other conditions that are caused by stress. Chicory is very beneficial for healthy. Especially its root because it is rich in polyphenols, which are antioxidants. Thus, its consumption promotes the removal of poison from the body. So it cleans and protects all our organs and stimulates the work of our immune system. 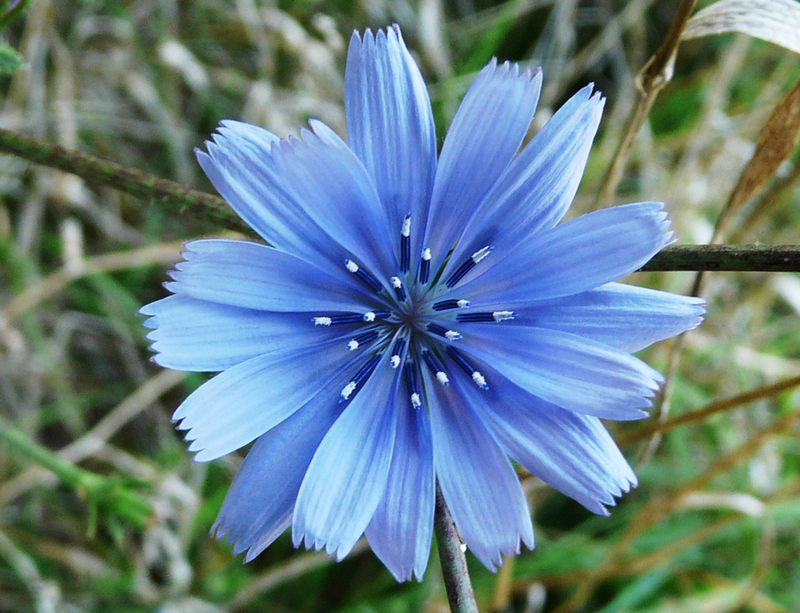 Some studies indicate that the chicory extract affects the reduction of tumor development. For its anti-tumor activity fructane it contains is responsible. Its particularly good preventive action indicates cancer of the colon and breasts. One of the strongest impacts is on our digestive tract. It stabilizes the work of digestive organs and removes digestion problems. It efficiently calms our colon and reduces the problems caused by gastritis, colitis and improves the absorption of nutrients in the body. Inulin has the effect of probiotic, so it preserves and restores the intestinal flora, accelerates digestion of fat. Because it contains fibers and vitamins, it has an effect on the proper peristalsis of the bowel and on the secretion of gastric juice. Oligofructose from it contributes to the establishment of the intestinal micro flora balance. Thus it affects the perfect functioning of the colon and prevents the occurrence of imprisonment. Chicory for weight loss helps because it has a positive effect on metabolism and is a good ally in maintaining the desired body weight. Due to the abundance of fibers, it successfully regulates the level of hunger hormones in the bloodstream. While due to the content of oligofructose, it suppresses appetite and provides a sense of satiety, thus reducing calorie intake and facilitating the maintenance of ideal weight. You probably know the famous Frank's coffee substitute. It resembles a homemade Turkish coffee by its taste, and has proven to be a very healthy alternative to the favorite drink of many of us. The difference is that it does not contain caffeine, and it is very healthy. Preparation is not complicated, so you can do it yourself in your own home. It comes from a chicory root, and some are mixed with plain coffee. The root is taken in autumn, and washed well and after that dry it. Cut chicory root longitudinally in half, and dry it in oven grids at a temperature of about 50-60 degrees. The oven should be open, because the root does not need to be baked by dried. Leave it for about 30 minutes, and repeat the procedure for several days in a row until it is completely dry. After that, it is milled and a powder like coffee is obtained. After this, everything is well known to you. Coffee is prepared very easily, as are other hot drinks. About 3dl of water goes to one teaspoon of ground chicory root. Let the water boil add the powder and let it boil again. After that, cook for another two minutes on a light fire. Then remove it from the heat wait until the deposit settles, and then proceed through the sieve. This is actually the biggest difference in preparation. Use this healthy beverage warm, mostly before or after a meal for better digestion. If you prefer sweetened, add a little honey, brown sugar, agave juice or maple syrup. If you like, you can also add cinnamon or ginger. Cinnamon sticks give a better flavor, insert them only when water boils. With this beverage, soy milk is great, which is added after you strain the drink. Chicory tea can be prepared from roots, trees, leaves and flowers. They taste a bit differently, but whichever variant you decide on, you will do the right thing for yourself and your health. Here are some options for preparing tea from water. Put a spoon of dry flowers in the cup and pour with 2dl of boiling water. First it should stand for 2 hours, then strained. This amount should be divided and drunk twice a day (one deciliter per day). This is a true drink for the afternoon relaxation. It relieves nerve irritation and helps with insomnia. This drink is prepared in a slightly different way than the previous one. You need half a spoon of dried root to cook for between 5 and 8 minutes in a light fire in 2dl of water. Then take off the fire and after 15 minutes, strain it. Such tea can be drunk in the amount of 3 cups in a day. Especially esteemed is a water-based tea for weight loss, which can be obtained as a finished product in pharmacies. However, the recommendation of the phytotherapist is to make a drink yourself, because it is more effective. On one dl of water add a spoon of chopped dry plants. Pour over with hot water, cover the cup and leave for half an hour. After that, strain the chicory tea and it is ready to drink. You can drink up to two cups of this tea per day. You can prepare it from fresh plants and then you need two spoons of chopped blend of leaves and roots. It is known that chicory tea is more than good for your digestion since it will promote it and will allow you to empty the bowels daily. Chicory tea also exhibits its healing properties in skin problems such as eczema (dermatitis) and in the case of subcutaneous ulcers. Usage for coatings is very simply. First, take 20g of plants and cook in half a liter of water for 5-8 minutes. Leave it to cool and then proceed. Wrap the gauze and hold the cladding in the place where you have a problem. You need a liter of 50 percent alcohol, 200 g root and 100 g of the leaves. First clean the root and wash the leaves well. Then crush it all and pour alcohol over it, and then close the bottle or jar well. So keep in a warm place for a month and then strain through a clean gauze. When you have any of the above problems, you can use this tincture. Take it 3 times a day mixed with water or some tea 10 to 15 drops. To prepare a fresh and healthy drink in a blender, you can try it mixed with other fruits and vegetables. Roots and leaves are used. With pineapple, orange or apples combined, it loses a lot of bitterness. Chicory salad is prepared mainly from young terrestrial leaves of this plant. However, as much as it sounds strange the flowers can be used for salads. Chicory is usually mixed with other vegetables, in order to alleviate the bitter taste. Here's a very simple recipe for you. You need two young ground chicory roses, one tomato and two garlic cloves. The necessary spices are pepper, with, apple vinegar and olive oil. All ingredients are cut, seasoned to taste and mixed. Chicory salad combined with potatoes is also excellent. You will need 3 large or 4 smaller potatoes, 2 chicory stems and onion. Then pepper, also olive or pumpkin oil. First cook the potatoes, then cut them into the rings. Clean the chicory and wash it well. Cut the onion on the rings. Mix all ingredients and season to your taste. When preparing for food chicory recipes are various for salads, but it is also used as a cheese. Preparation is essentially the same as for other green vegetables, such as spinach and blanches. Young, fresh plant with root wash well, chop and fry with garlic, on olive oil until it softens and then add salt. It can be added to many dishes, and is easily combined with a variety of herbs and vegetables according to your imagination. Chicory is a plant related to the marigold and ambrosia. For this reason there is a possibility that some are allergic to it. So be moderate and cautious the first few times when using it. People who have gallstones should not overdo it with its use, as it can lead to complications. Also, patients with gastritis should be moderate in the use of chicory. Contraindications can occur with medicines for reducing blood pressure and slowing heart rate. Because water therapy reduces the adoption of these medicines in the human body. Especially this is the case with beta-blocking drugs. In pregnancy, chicory is not recommended at all. Because it can affect the premature appearance of contractions, and cause complications or abortion. It should also not be used during breastfeeding. Excessive use can lead to diarrhea. So if you decide to replace your regular coffee with chicory coffee, use it in smaller quantities. With this plant, the story is very simple, chicory coffee, you like it or not. Often people ask questions where to buy it. Tea can be found in healthy food stores and various bio-shops. While in the grind form for coffee preparation, it is also available in some of the larger better-equipped markets. However, the Internet is not a part of the market that we can forget. The price of chicory coffee of about 200g, ranges between 1-3 dollars. While you need to set aside for a dried root of tea about 1.5$ for 50g. In addition to the general well-being for our health, it's really not much. Here you can also read about healthy coffee substitutes.